Need it developed quickly, professionally and cost-effectively? We can help. I couldn’t be more happy with the work.... Rating: 10 out of 10. Brian is capable of thinking strategically, inspiring others to execute his vision, while being able to execute the vision himself. I have found it rare among people in the software industry who can both be visionary as well as possess the skills to execute. Brian Conte is one of the most brilliant men I know … I’ve never known a more dedicated or talented entrepreneur. 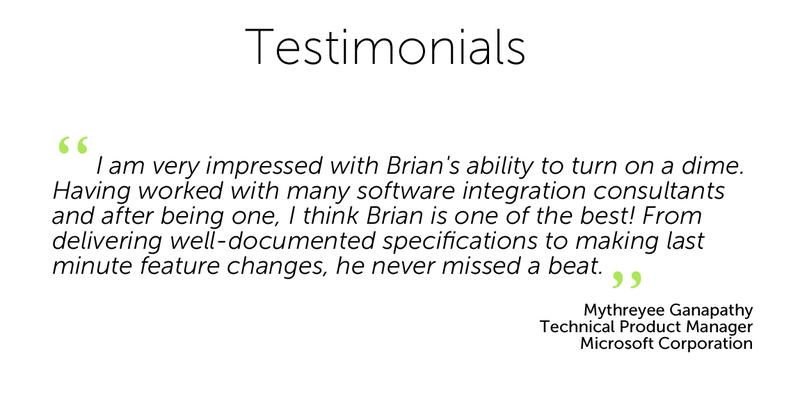 Brian is the quintessential entrepreneur, as well as a world-class software engineer who came out of the Windows OS group. Brian has demonstrated ability to start small, work smart, and make real money in a tough landscape. Brian has been a pleasure to work with – he is a prompt, courteous, and respectful team player whose top priority is always to deliver a high quality product. His software methodology and expertise are among the very best in the industry; at the same time, he respects others’ opinions and fosters a real team spirit. Brian is a seasoned professional whose years of experience and commitment to excellence make him a valuable asset wherever he goes. I’m very happy. Everyone has been so friendly, professional, and accommodating. Rating: 10 out of 10. The work you have done for us has been fantastic. Rating: 10 out of 10.